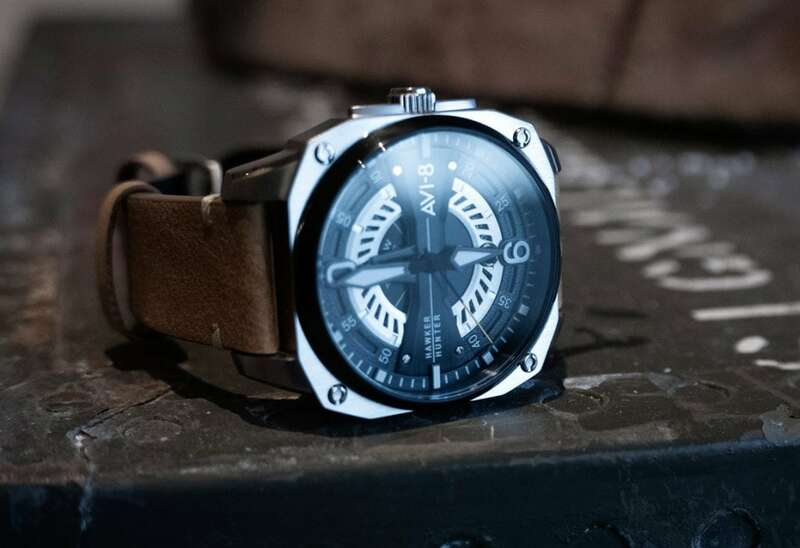 The Hawker Hunter watch by AVI-8 pays homage to the 1950s jet-powered fighter aircraft. 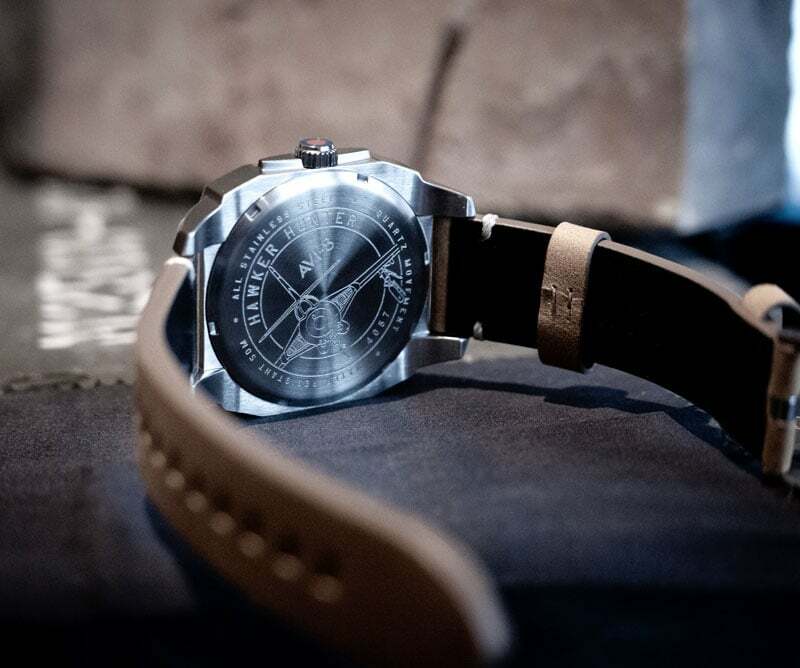 Several features from the choice of materials to the font of the dial underline the aviation theme making it a cockpit on your wrist. 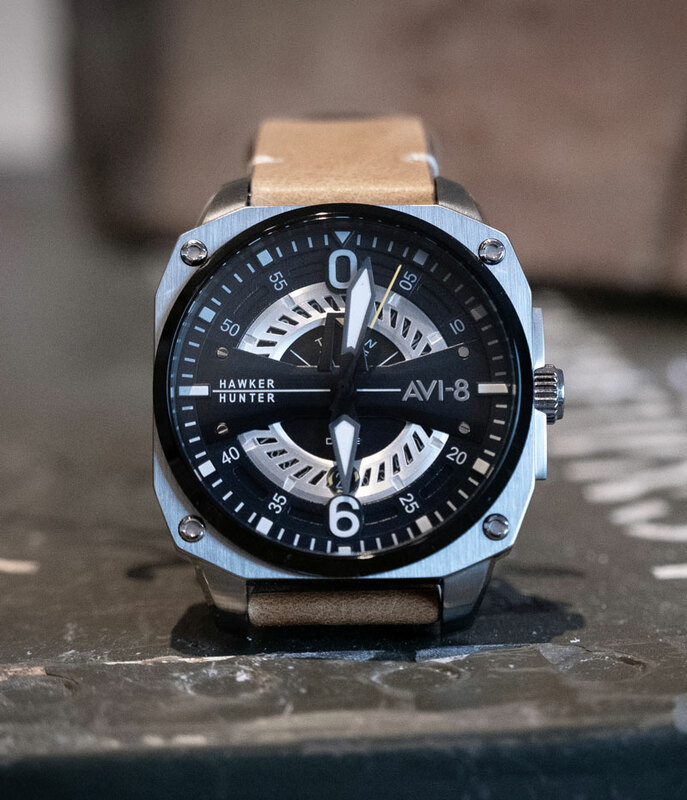 If you’re looking for a quartz powered aviation inspired timepiece, AVI-8 is a good place to look! 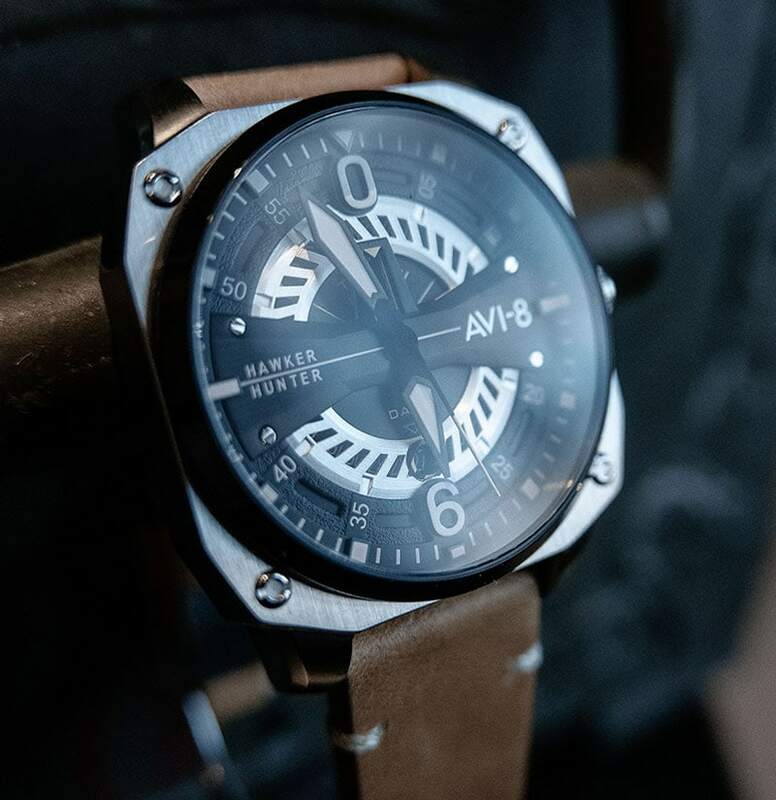 The Hawker Hunter model AV-4057-02 is carved and forged out of marine grade 316 L stainless-steel and has an octagonal case with polished detail. The watch opens up at the lens to display a unique dial design that echoes the machined engineered elements of the Hunter’s breakthrough jet engine design. The AV-4057-02 is an eye-catching and well-made aviation inspired timepiece! A serrated turbine inspired layer masks the date and day display and adds depts and complexity to the design. As a cool feature, the font used for the day and date is a typography found in the Hawker Hunter fighter planes of the 1950s. Bold tooled hour and minute hands makes it easy to read the time and the contrast detailing of the seconds hand adds a nice touch of color. 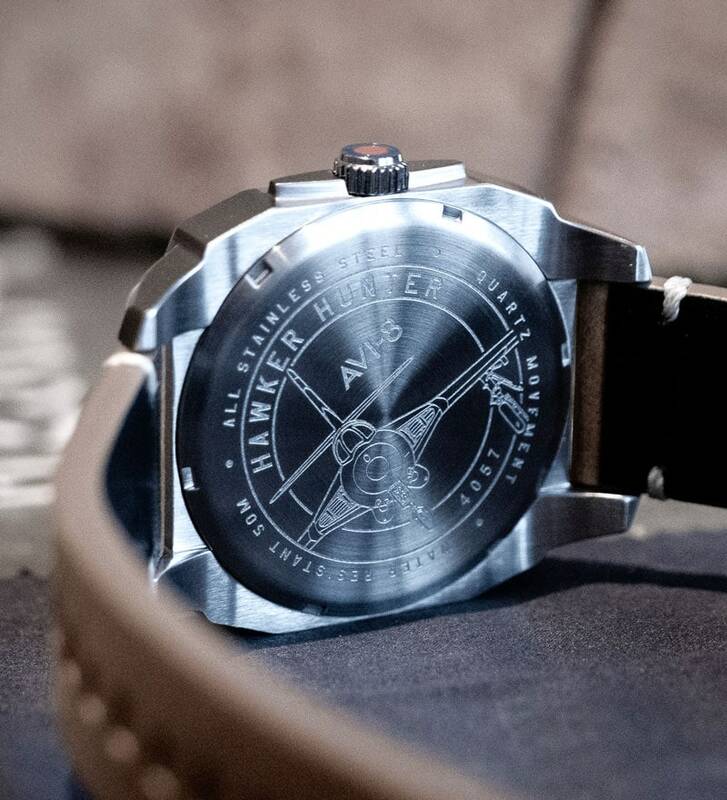 The crown guard to the right of the watch is a reference to the front view of the Hunter’s intakes. 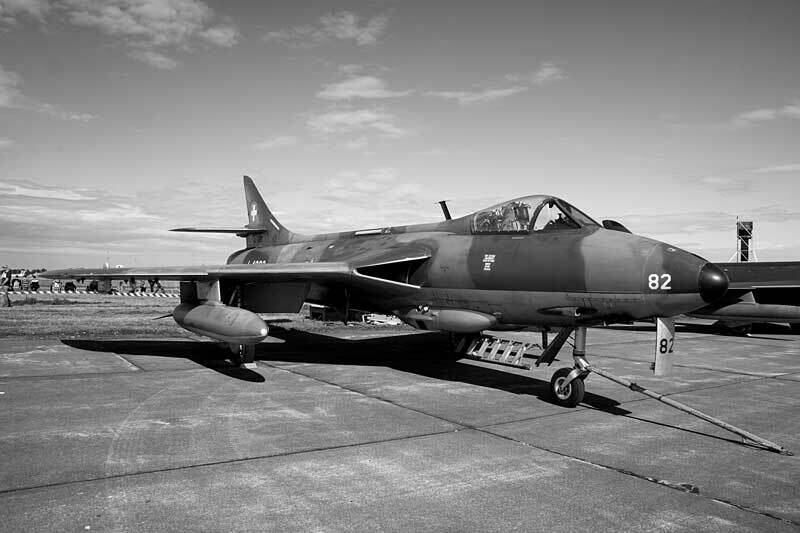 The Hawker Hunter was a single seater jet propelled fighter developed by Hawker Aircraft in the 1950s to meet the needs of the Royal Air Force and their allies. Entering service in July 1954, the Hunter F.1 was the first high-speed jet aircraft equipped with radar and fully powered flight controls. A prototype of the Hunter, flown by Neville Duke – broke the airspeed record in September 1953. To this date, the Hunter remains an iconic benchmark of the Jet age in aircraft fighter technology. The Hawker Hunter AV-4057-02 is a bold and honest timepiece with clear references to its aviation inspiration and the historic Hawker Hunter fighter jets. Looking past a couple of misaligned elements and less-refined brushing, the watch has a genuine quality and surprising detail considering its price range. The first impression was both good and bad as we were happily surprised about the textile covered box…but less impressed about the poor stitching. On the positive side, we are very fond of the complex dial with the multi-layered design and clear references to aviation history. As some other reviews have pointed out, the 4 screw heads in the dial are fake but nonetheless, they add a nice touch and actually fits in quite well and supports the military design. The AV-4057-02 is an eye-catching and well-made aviation inspired timepiece! Three different models are part of the AVI-8 Hawker Hunter collection that in total counts 14 timepieces. The colorways range from military green to black and blue with details in red and yellow and with classic straps in genuine leather. Common for the collection is the bold cockpit instrumentation inspired case that measures 45mm. Check out: Breitling Curtiss Warhawk!